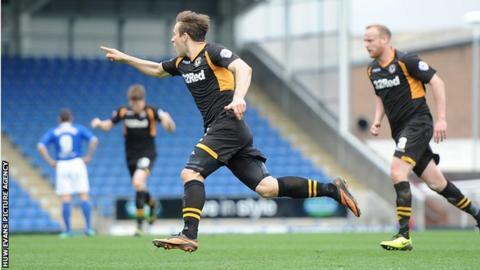 Max Porter's late equaliser rescued a point for Newport County at promotion-chasing Chesterfield. Jimmy Ryan had given Chesterfield the lead with a brilliant angled chip over County goalkeeper Ian McLoughlin. But with time running out Porter picked up the ball on the edge of the Spireites area to shoot home. Chesterfield remain in the automatic promotion places but Burton Albion and Fleetwood Town won on Saturday and both are now just three points behind. "It was a spirited display, we showed good character... we got a little bit fortunate today but once we got through that spell I thought we could get something out of the game. "We started the game well. Young Shaun Jeffers came in and I thought he caused them problems - a couple of opportunities he created himself - and we looked imposing and comfortable at the back. "It was pleasing to go in at half-time 0-0 which gave us a chance, but to concede the goal as quickly as we did in the second half really put us on the back foot." Match ends, Chesterfield 1, Newport County 1. Second Half ends, Chesterfield 1, Newport County 1. Corner, Chesterfield. Conceded by Ismail Yakubu. Attempt blocked. Christian Jolley (Newport County) right footed shot from outside the box is blocked. Corner, Chesterfield. Conceded by Ryan Jackson. Attempt blocked. Gary Roberts (Chesterfield) right footed shot from outside the box is blocked. Foul by Mason Bennett (Chesterfield). Substitution, Chesterfield. Mason Bennett replaces Jay O'Shea. Substitution, Newport County. Tom Naylor replaces Lee Minshull. Goal! Chesterfield 1, Newport County 1. Max Porter (Newport County) left footed shot from outside the box to the bottom left corner. Assisted by Michael Flynn. Attempt saved. Marc Richards (Chesterfield) right footed shot from outside the box is saved in the top centre of the goal. Delay in match Ismail Yakubu (Newport County) because of an injury. Substitution, Chesterfield. Sam Hird replaces Daniel Kearns. Daniel Kearns (Chesterfield) wins a free kick in the defensive half. Rene Howe (Newport County) wins a free kick in the defensive half. Attempt missed. Jay O'Shea (Chesterfield) right footed shot from outside the box is just a bit too high. Substitution, Newport County. Christian Jolley replaces Chris Zebroski.